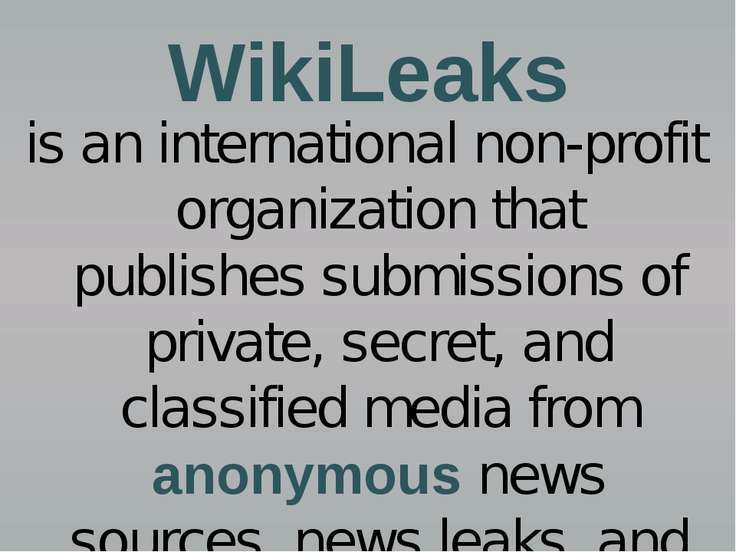 WikiLeaks is an international non-profit organization that publishes submissions of private, secret, and classified media from anonymous news sources, news leaks, and whistleblowers. 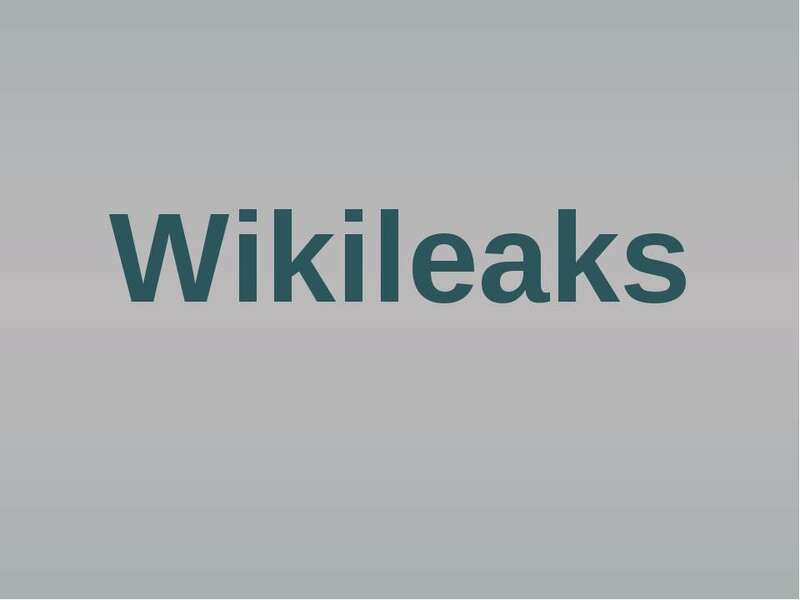 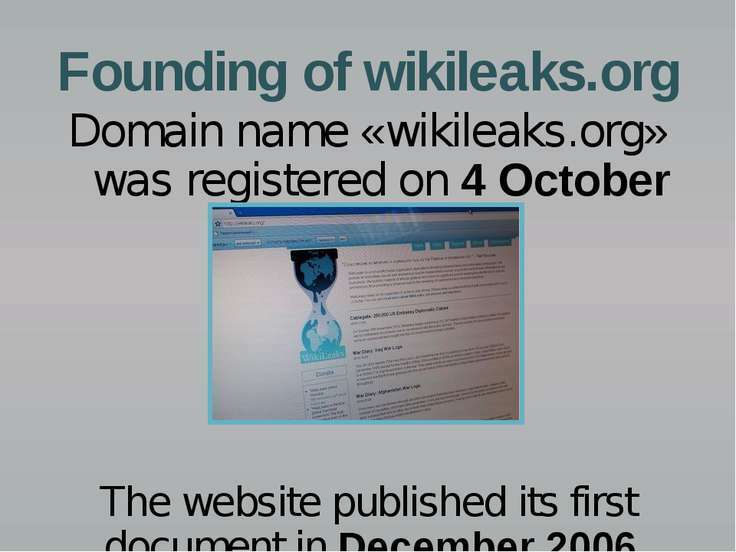 Founding of wikileaks.org Domain name «wikileaks.org» was registered on 4 October 2006. The website published its first document in December 2006.
Who is Julian Assange? 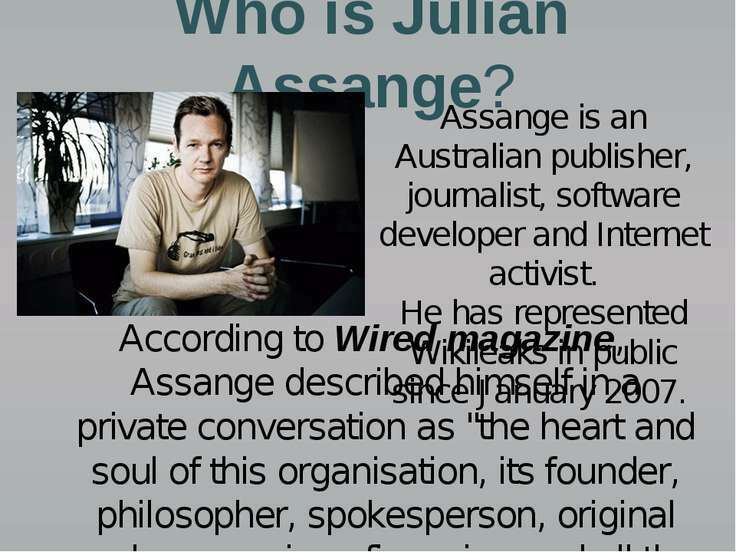 According to Wired magazine, Assange described himself in a private conversation as "the heart and soul of this organisation, its founder, philosopher, spokesperson, original coder, organiser, financier, and all the rest". 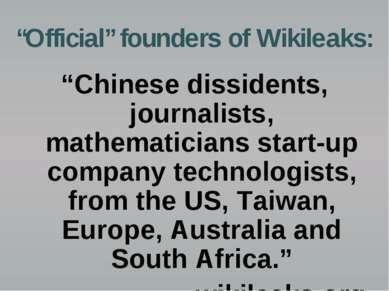 Assange is an Australian publisher, journalist, software developer and Internet activist. 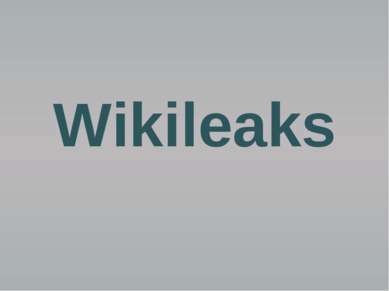 He has represented Wikileaks in public since January 2007. 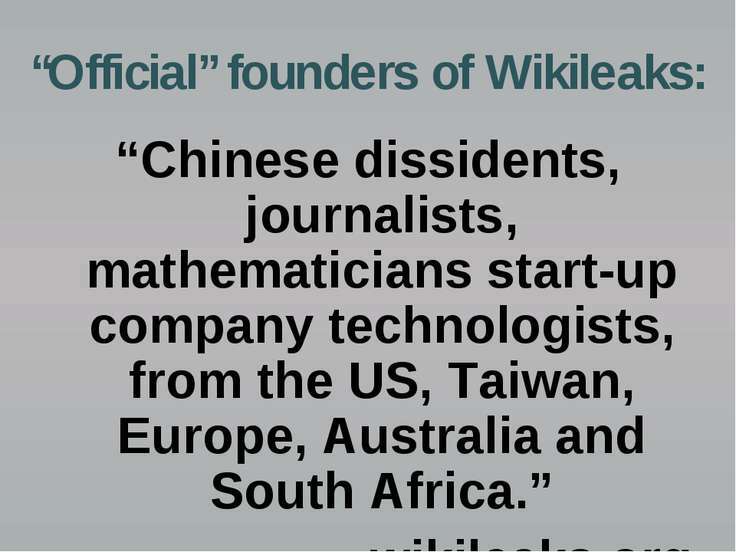 Goals of WikiLeaks WikiLeaks primary interest is in exposing oppressive regimes in Asia, the former Soviet bloc, Sub-Saharan Africa and the Middle East, but we also expect to be of assistance to people of all regions who wish to reveal unethical behaviour in their governments and corporations. 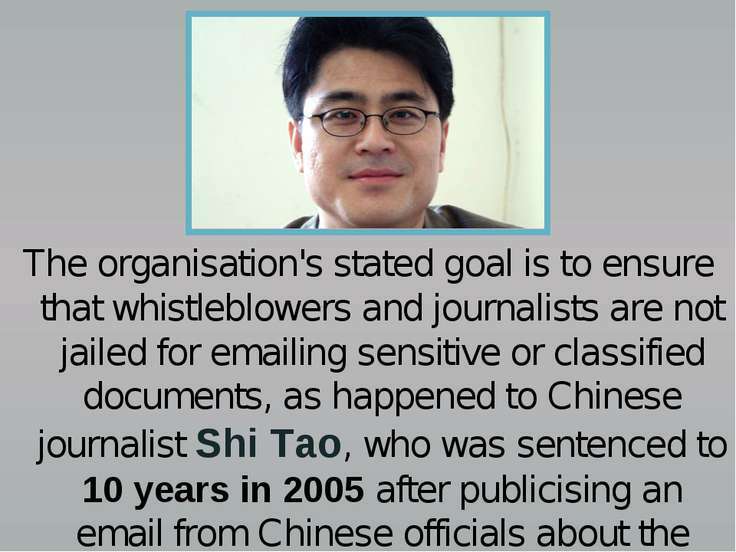 The organisation's stated goal is to ensure that whistleblowers and journalists are not jailed for emailing sensitive or classified documents, as happened to Chinese journalist Shi Tao, who was sentenced to 10 years in 2005 after publicising an email from Chinese officials about the anniversary of the Tiananmen Square massacre. Admistration The WikiLeaks team consists of five people working full-time and about 800 people who worked occasionally, none of whom were compensated. 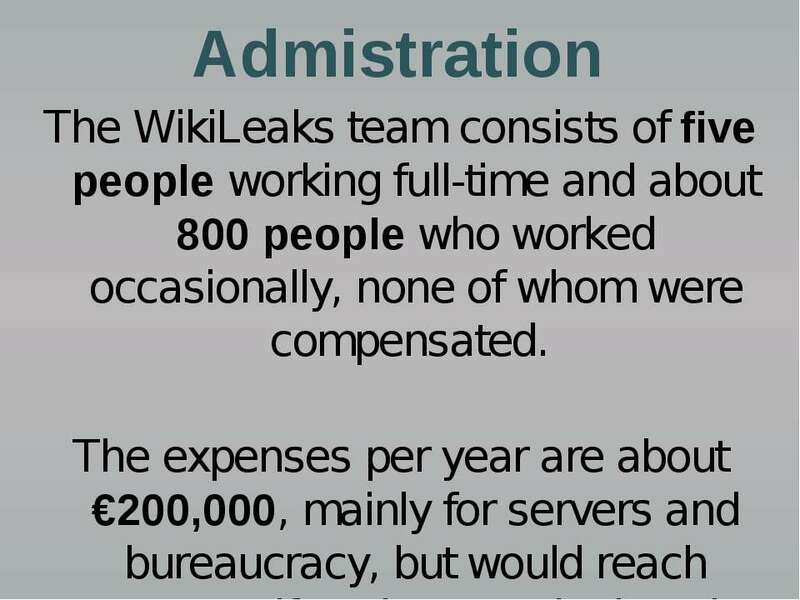 The expenses per year are about €200,000, mainly for servers and bureaucracy, but would reach €600,000 if work currently done by volunteers were paid for. 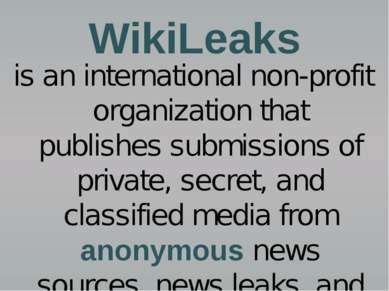 Financing WikiLeaks is a non-profit organisation, and it is dependent on public donations. 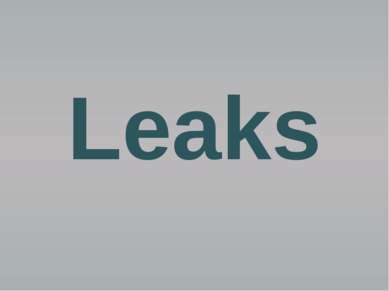 Its main financing methods include conventional bank transfers and online payment systems. 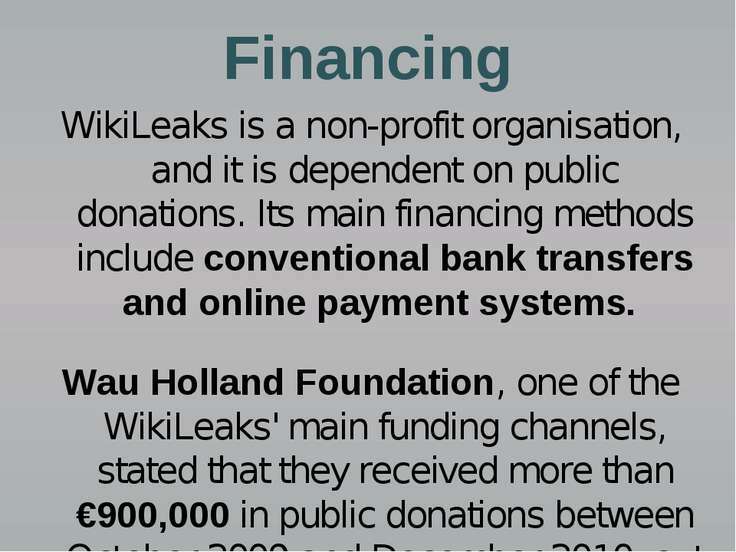 Wau Holland Foundation, one of the WikiLeaks' main funding channels, stated that they received more than €900,000 in public donations between October 2009 and December 2010, out of which €370,000 has been passed on to WikiLeaks. 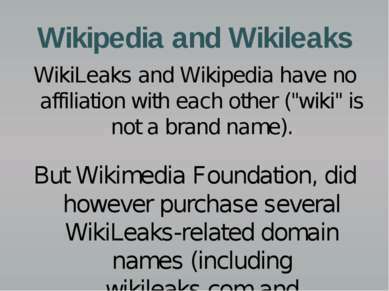 Wikipedia and Wikileaks WikiLeaks and Wikipedia have no affiliation with each other ("wiki" is not a brand name). 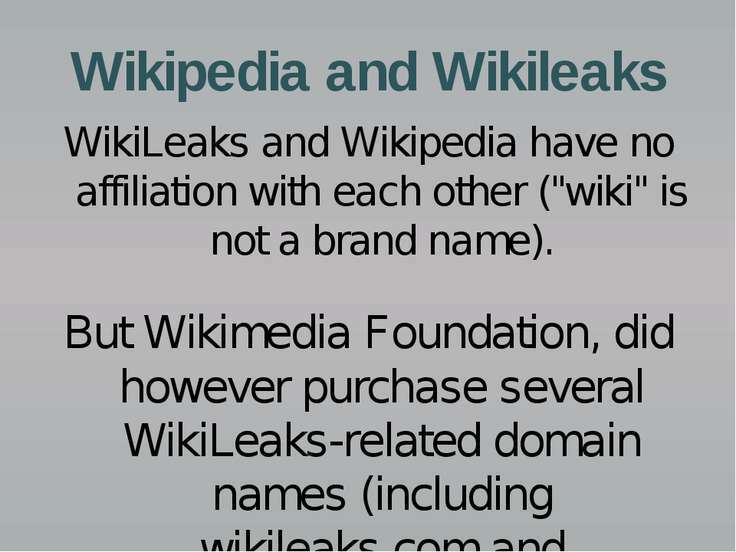 But Wikimedia Foundation, did however purchase several WikiLeaks-related domain names (including wikileaks.com and wikileaks.net) as a "protective brand measure" in 2007. 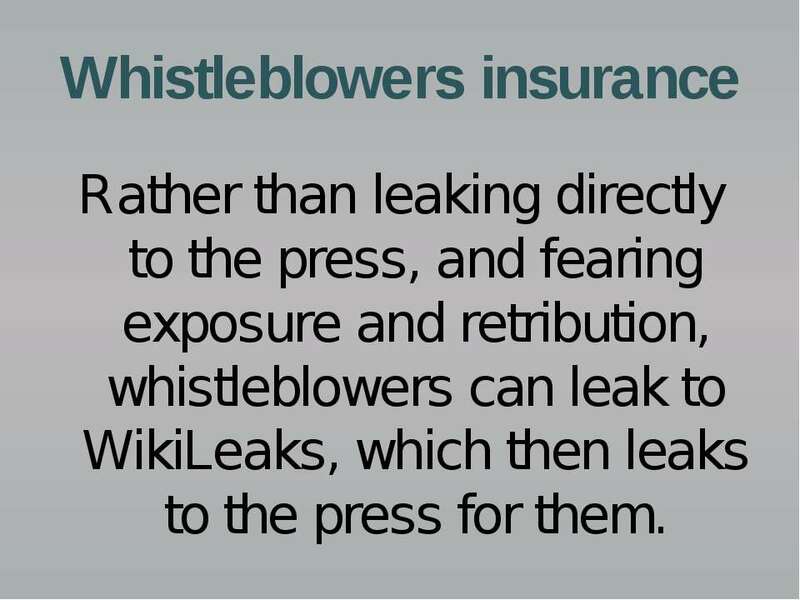 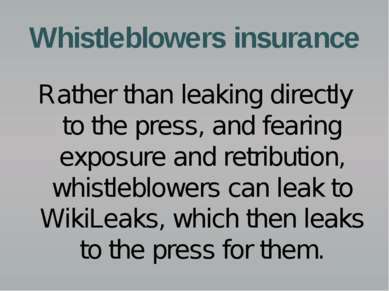 Whistleblowers insurance Rather than leaking directly to the press, and fearing exposure and retribution, whistleblowers can leak to WikiLeaks, which then leaks to the press for them. 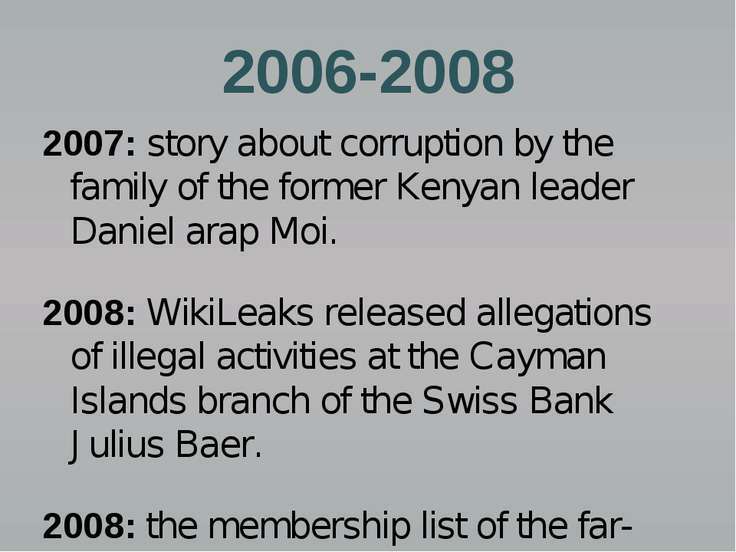 2006-2008 2007: story about corruption by the family of the former Kenyan leader Daniel arap Moi. 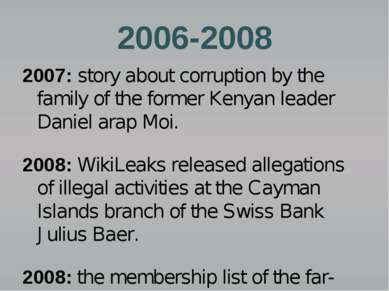 2008: WikiLeaks released allegations of illegal activities at the Cayman Islands branch of the Swiss Bank Julius Baer. 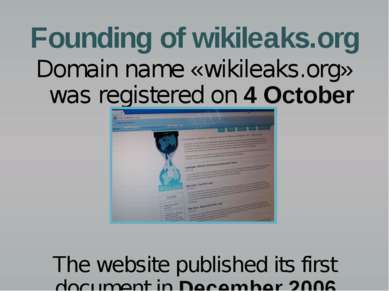 2008: the membership list of the far-right British National Party was posted to WikiLeaks. 2009 January: WikiLeaks published 86 telephone intercept recordings of Peruvian politicians and businessmen involved in the 2008 Peru oil scandal. 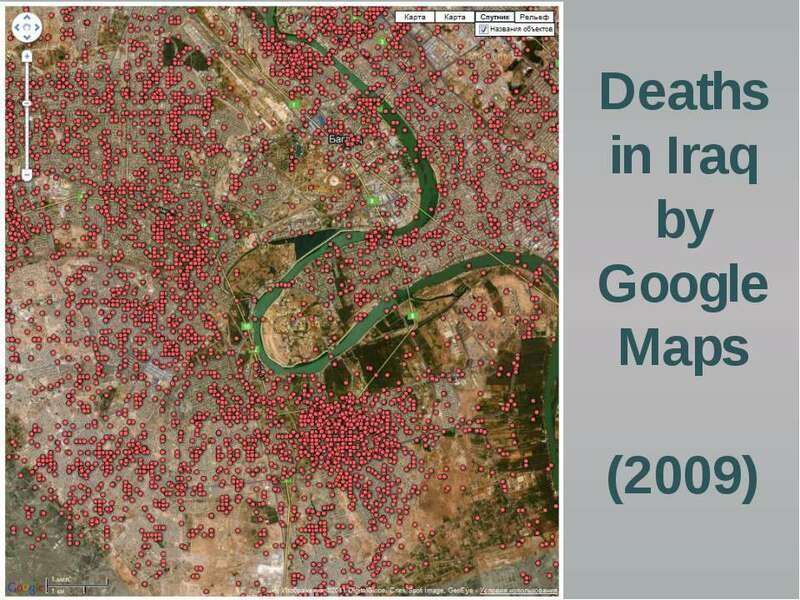 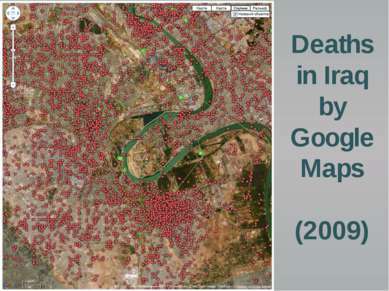 July: Site released a report relating to a serious nuclear accident that had occurred at the Iranian Natanz nuclear facility in 2009. 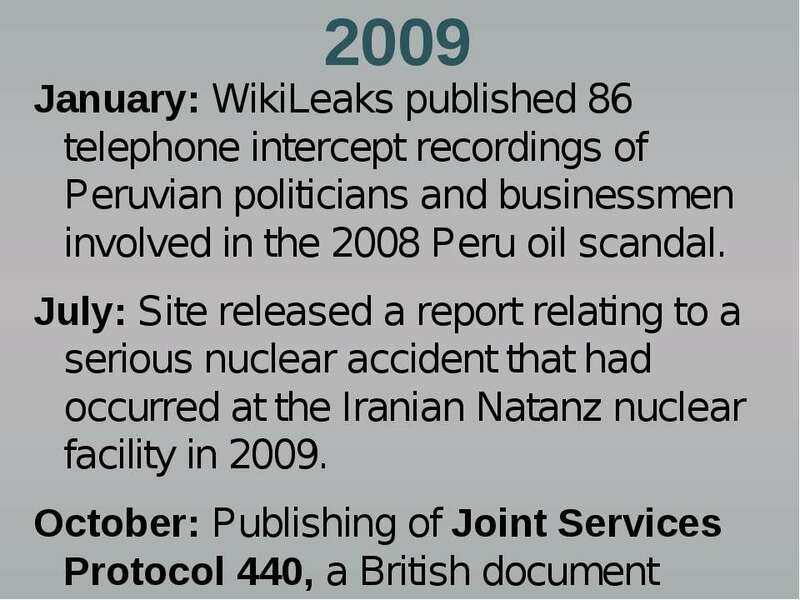 October: Publishing of Joint Services Protocol 440, a British document advising the security services on how to avoid documents being leaked was published by WikiLeaks. 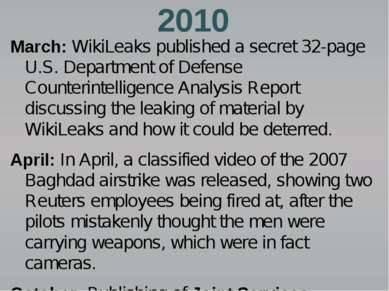 2010 March: WikiLeaks published a secret 32-page U.S. Department of Defense Counterintelligence Analysis Report discussing the leaking of material by WikiLeaks and how it could be deterred. 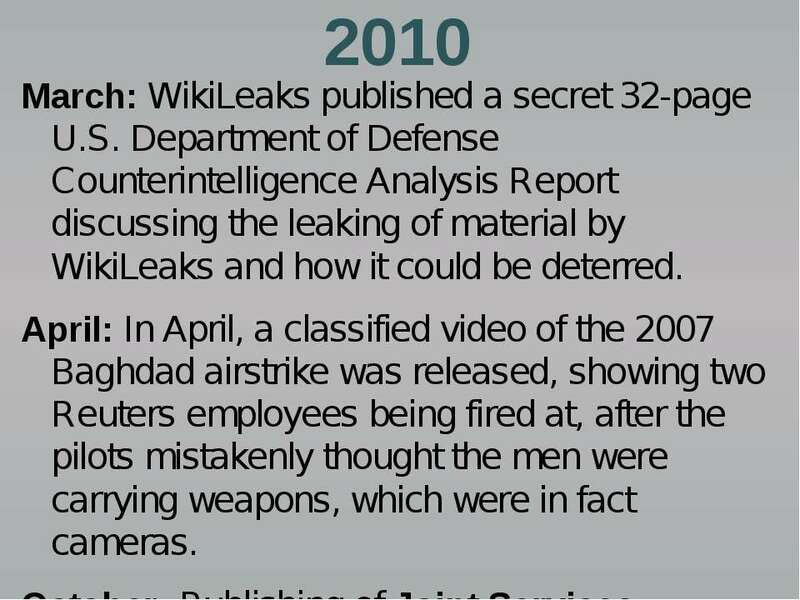 April: In April, a classified video of the 2007 Baghdad airstrike was released, showing two Reuters employees being fired at, after the pilots mistakenly thought the men were carrying weapons, which were in fact cameras. 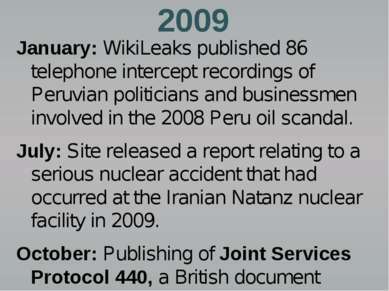 October: Publishing of Joint Services Protocol 440, a British document advising the security services on how to avoid documents being leaked was published by WikiLeaks. 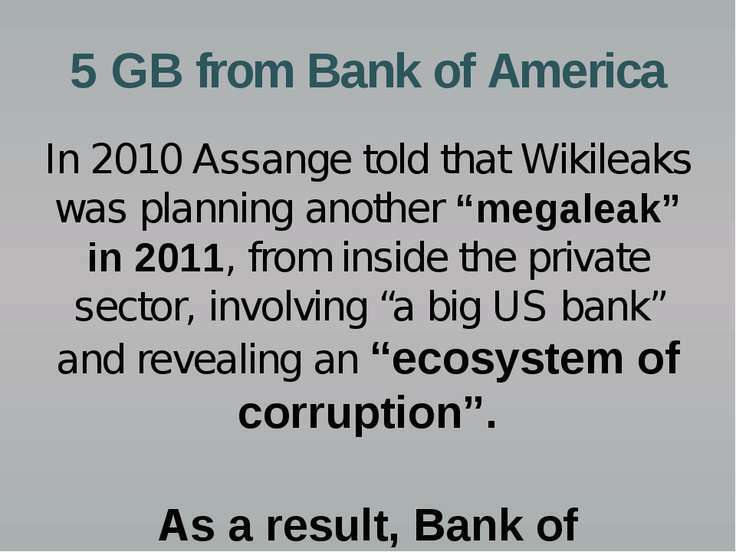 5 GB from Bank of America In 2010 Assange told that Wikileaks was planning another “megaleak” in 2011, from inside the private sector, involving “a big US bank” and revealing an “ecosystem of corruption”. 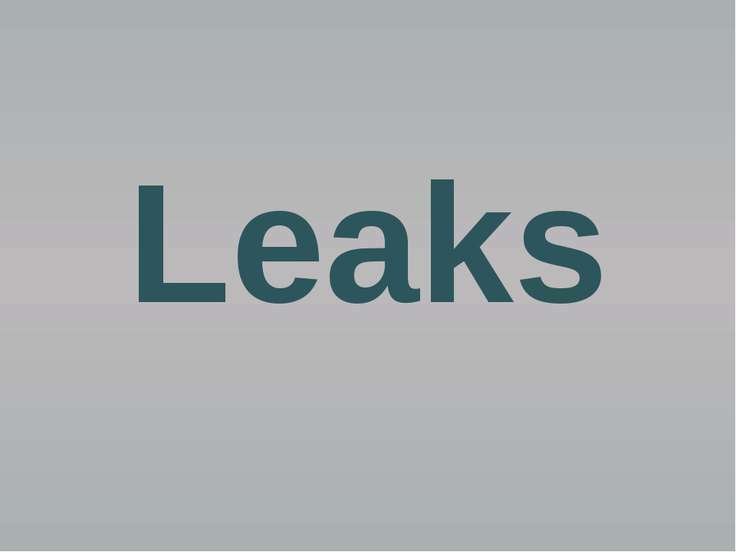 As a result, Bank of America’s stock price fell by 3% after this announcement.